DEVLOG#27 – Playing with Water…. Hello all, it is now Amethyst writing the blog and we finally meet again to talk about game design aspect of Ascender. Lets begin and get wet! One of the new element in Mustang that will be part of game play element is water. The water element is inspired when I played Splatoon, I love how they incooperate splating ink into the game. For those who don’t know the game, you can check out video below and if you have a Wii U you should consider to put the game into your collection. Mustang is the center of farming activities of GOA’s civilization. 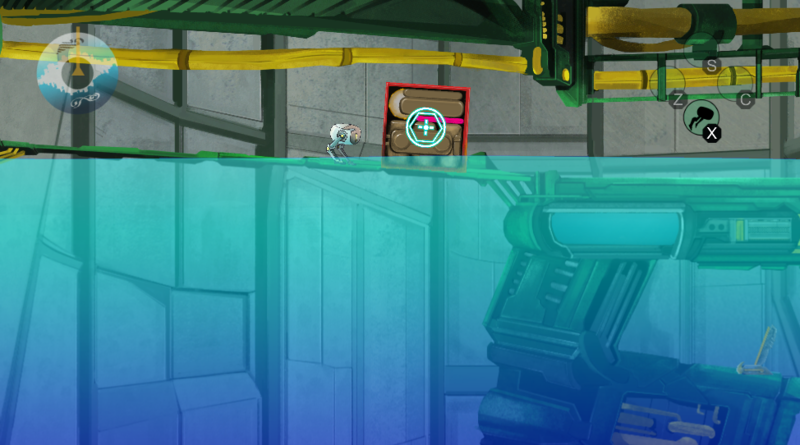 After thinking and experimenting a lot on creating water based puzzle, we decided that water is going to be one of the hazard that the player need to avoid. We are also able to control the flow of water in some part of the water to solve the puzzle. Well, water is going to be a central theme for puzzle in Mustang. As you can see the water is flowing down as it is triggered. The question is why does Sky need to do it? Well, we can actually move item from one place to another using the water 🙂 So you need to be witty in order to finish the puzzle. I want to show more but we can’t wait for all of you to test the puzzles yourself. We are currently preparing something for all of you to test, hopefully next week you can try it all out. It’s Kunzite here, junior programmer in GameChanger Team and another first timer writer in this blog. In this team, I am responsible to merge and organize the game contents and for today I am the host for this tour of development of Ascender. As you guys have already seen, we have a team of great artists who have given their wonderful hand drawn artworks into this game and it would be wasted if we don’t display it into the screen, right? In the other hand, we can’t (and we won’t) display everything in the screen so you won’t see the bad side parts off-screen (secrets of the puzzle in the game :3). To do that, we need to adjust the camera in some parts of the game to give you just a perfect view and not ruin your pleasure playing this game. I am doing it by separating the scene by different regions. Then we gave those regions some identifier and attributes so the camera can identify which region it’s belong to. Each region has their own attribute and one of them is called “camera size”. When the camera enter a region, it will access the region’s camera size attribute and the camera will slowly move to that size either it’s moving forward or backward and give a great sensation. If you want to learn more about camera in 2D games, you can check this which gives great information about 2D games camera. Here is the view of the zoom effect I was babbling about. Now I want to show you Sky’s new ability. If you played our alpha test (I’m sure you guys did), you will know that Sky can swing around by the hook, right. Now, there is some special skill where he can pull himself to the hook, hang in there for a while, then launch to a destined direction. Well, that’s all for now guys. Stay tuned in this blog, there will be something special soon. Don’t let yourself miss that. Keep calm and peace out. I’m not sorry for that title. Hi! The name’s Peridot and I’m part of the Art team here, nice to meet you all. Today is my first time writing here, more like first time ever writing something like this, so I’m going to try my best. Today’s topic’s about the new district: Mustang (Duh! ), especially the art part (or that’s as far as I can go). Back onto business, before I start explaining, I want to refresh your memory regarding Ascender. This is the concept world of Ascender, written by the art director Amber. Also, Ruby, our scriptwriter told you about the districts exist in Goa, here. Now that your Ascender’s memories have returned and you have basic info of Mustang, let’s talk for real. As written by Ruby, Mustang’s the source of food for the citizens of Goa. If you’ve played our alpha game (which can be found here), you’re playing the district’s below Mustang called Dolopo. You could see that Dolopo has a lot of brown colors with all those metal-thingamabobs whereas Mustang has a lot of greens, due to, yes, you guessed it right: its farm fields among other things. There aren’t a lot of buildings here (compared to Dolopo of course), because the farms are the main feature in Mustang. Its farm fields based on an agriculture technique called ‘terracing’. I helped with the drawing on the farm fields behind the focus ground using traditional watercolors with a little digital polishing (We do have technology). Oh yeah, to be able to make the crops grow properly until harvest time, they used an artificial sunlight. Well, I don’t know what to explain anymore about the Mustang situation, so here are more sneak peek of Mustang. Last, but not least, again thank you very much, see you again and have a wonderful day! Hi!! I am Moldivite from GameChanger Team, I am a junior 2d artist. Today, it will be my task to deliver you some of insight regarding our game development. I will give you a quick tour of inside Dolopo. Our art director, Amber, given the task to develop the Interior of Dolopo to Fire (the intern) and me.It will be the last task for Fire and we will be missing him for sure. Now lets start talking about Interior!!! In the process of making it unique we have to know what is the purpose or intent of the buildings. It does not need to be complicated, the building purpose can be simple. Such as, hotel is the place to stay, hospital is where citizen have rest and treatment, and post office is where people send letters. Knowing how the building works also help us creating more details in the interior. We can design items that is present within the building. I will give some interior breakdown in Dolopo, for now which interior get my breakdown list is, post office, medical center and research center. The first to breakdown is post office. First thing to do is draw a sketch of the post office, this is done by Fire, with direction from our art director, Amber. Following picture is an early sketch of the post office, early sketch by Fire is only the focus ground. Can be seen on sketch, there are registration desk, a delivery room and letters and meowl placefor takes rest, meowl itself is the sender of the letter in Goa. after receiving the focus ground, it is my turn to digitalize the post office, following picture is the results of digital. After converted to digital, post office look more attractive isn’t it? You can see the top right spot for meowl, I added some hay there. Because that is a place for meowl to rest and gather (after a long journey full of peril to deliver mail), so I though that place should look comfortable enough for meowl. And don’t forget about background in the interior. Here’s backround that has been applied to the focusground. At the center of the background right behind the registration desk, there is a map on the wall and a closet containing a stack of books and letters, the map on the wall is to facilitate the mailer in showing their destination. Overall background made darker because of the geographical location of the post office itself is located at the bottom of town Dolopo. Just like post office area, we get started with a sketch first. In the sketch, there are two mattresses rest and space registration or space for registration. There is also an upstairs room, but the upstairs room is not accessible. The upstairs room was made to show that at the medical center is not a small building which have some medical tools that can not be seen on the 1st floor, such as wheelchairs and oxygen tanks on top. After I finish with the digitalization, I made the top room that can not be accessed darker. So players can focus on the bottom ground. The interior is quite small this time, because the concept of this medical center is not a hospital but just a health center. If we look at the research centre exterior, we can imagine that this building will have a large interior with a more advanced technology than the other buildings in Dolopo. Therefore, Fire make escalator in the interior, because the research center itself has two floors. Let we see the research center sketch by Fire. This time we get a two sketch from Fire, on the first floor focus ground sketch directly exposed to the escalator. Fire itself received a referral from Amber that sky is not too explore part of the 1st floor and was immediately directed to the second floor. On the second floor, the escalator was immediately arrived at scientist’s room, there is a research table with reaction tube, bookcase and a computer along with the server. At the top there is a box containing the material, tools and equipment for research. After digitalizing and combining 2 floors you’ll see a different, yap right, there is an additional 1 room below focus ground 2nd floor, and a tube in it side. The addition of the interior is done because if directly added and incorporated into Unity program there will be gaps at the bottom 2nd floor and under the gate on the 2nd floor, and make the focus ground drift. Even after, digitilization is done the room still looks a little less so visible as a research center of the building. That is why we are now strengthten the background so that it looks more to be as research center. With background tubes and glass,we can show that this is indeed a big research center just as seen on the exterior. Background wall that seemed neat and simple make an hygienic impression on the interior. Hygienic itself is one trait that is guarded by the scientist. Differences in the making exteriror environement and interior environment are in the manufacturing background. Interior does not as complicated as GOA exterior creation that uses parallax, it only uses one background image file.